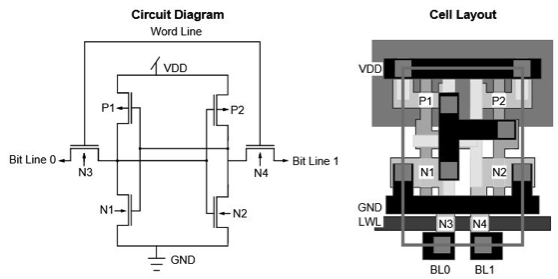 The scaling of the 6T SRAM cell is slowing and the surrounding circuitry is getting more complex, so more of the die will be taken up by SRAM at future nodes. The six-transistor static memory cell (SRAM) has been the mainstay of on-chip memory for several decades and has stood the test of time. Today, many advanced SoCs have 50% of the chip area covered with these memories and so they are critical to continued scaling. The 6T SRAM cell looks like two back-to-back inverters with a couple of drive transistors. The cell is designed by the fabs, optimized for fabrication, and in general breaks the conventional design rules that would be applied to the process. IBM 6T memory cell. Source: App Note 1997. ASML’s executive vice president and CTO, Martin van den Brink, stated at ISSCC 2013 that the SRAM bit-cell size might not be reduced from the 20nm to 10 nm node, and might even get larger at 7nm as it may need more than 8 transistors. Along with variability there are yield issues meaning that test and repair are becoming increasingly important for large memories. “Repair and ECC are possible for memories of most kinds, essentially reducing the raw-yield requirement by roughly 10X,” says Cheng. Each new process generation has needed innovation to keep the 6T SRAM cell alive and some are looking for alternatives. Those alternatives are new designs for the bitcell itself, a migration to different memory types, or advanced packaging techniques. But with the IoT, cost and power become much larger concerns. Zeidman believes it should be possible to create tools that can work out what you don’t need and then to achieve a significant reduction in memory footprint. Maybe that will be enough to stop the pressure on total memory area increases.